Mamuthones ready to march through town. All photos by Stephanie Ostroff. Leave the gondolas and glitter in Venice. In this small town in Sardinia they drink, they dance, they lasso strangers for good luck. A reader story. MAMOIADA, Italy – The rope slipped over my head and around my waist in one swift movement. I circled around and caught a glimpse of the lasso-hauling Sardinian kid who'd managed to ensnare me. The boy, dressed in soldier's garb (puffy white trousers, a crimson shirt, and a black sash at his hip), narrowed his dark eyes. The corners of his lips curved upward and his serious little face broke into a grin. Then he set me loose. I'd already lost track of how many times I'd been wrangled that day in Mamoiada. According to my Sardinian friends, this game of catch and release brings good luck to its unsuspecting participants. I felt I'd already been granted a healthy dose of fortune. I found myself in a remote Italian mountain village, a wide-eyed witness to a spectacularly bizarre Carnevale tradition — a procession of villagers bedecked in soldier uniforms and cowbell armor. Carnevale in Italy. The words conjure up images of glittering Venetian masks and ball gowns, a dazzling affair of brightly colored frill amid gently bobbing gondolas. Mamoiada at Carnevale is none of that. A rocky, sparsely populated outpost in Sardinia's wild Barbagia region, Mamoiada remains just out of grasp for most travelers. Pristine stretches of beach near Alghero and along the Costa Smeralda draw crowds of sun-seekers up north, while the capital city of Cagliari gets its share of tourists on the opposite tip of the island. Little Mamoiada, but a pinprick on a map, is locked inland. A vehicle, a strong stomach, and a talent for navigating unmarked roads prove essential if you want to reach it. With three Sardinians and two Americans jammed into one little car, it took us more than two hours to find our way to Mamoiada from northern Sardinia. We arrived by late afternoon, just in time to partake in the Carnevale action. It began with the clanging of bells; a hollow, ominous knocking of metal upon metal. As we were swallowed into the mass of onlookers lining Mamoiada's narrow main street, a troupe of men draped in dark sheepskin, faces obscured by ghastly wooden masks and hoods, charged into view. Large cowbells clung to their backs like armor, with smaller sets of bells latched across their abdomens. The Mamuthones had arrived. They seemed of another world, something sinister in the shape of their masks and the jangling of their rudimentary instruments. 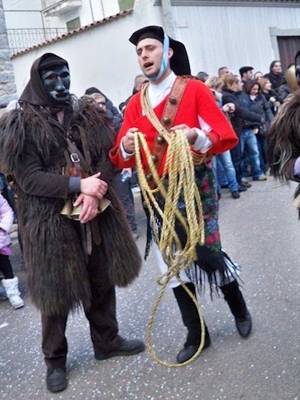 In this Mamoiada tradition that some say dates back 3,000 years, the Mamuthones represent shepherds transformed into their own animals, the idea being that during Carnevale the world is flipped on its head. Their function is simple: to drive away the village's evil spirits. Joining them in their quest were the Issohadores, the red of their uniforms popping against the muted tones of the stone-encrusted buildings. They, too, toted bells, harnessed sideways across their chests, with slouchy black hats strapped around their heads with ribbon. Dark sashes covered in floral embroidery and fringe hung across their hips. 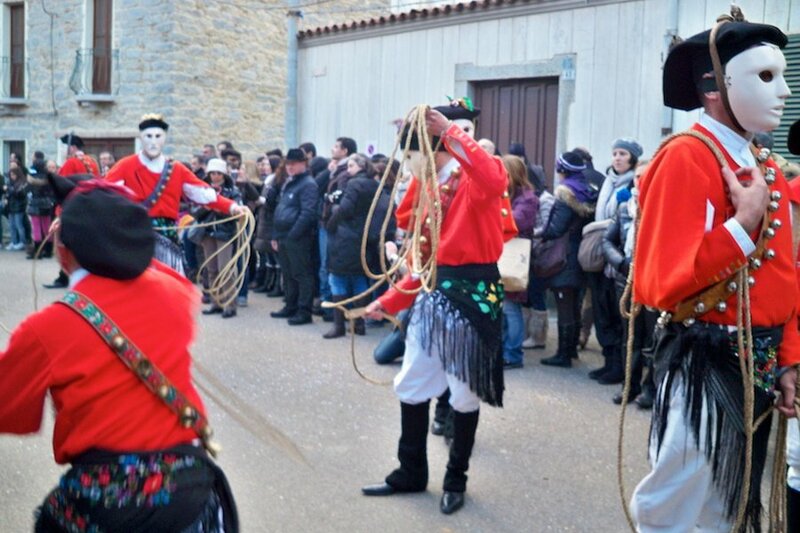 In the fantastical world of Carnevale, the lasso-wielding Issohadores embody Sardinia's invaders — likely Spaniards or Turks. They arrived in all shapes and sizes, boys as young as five or six joining their fathers and grandfathers in costume. Some donned white masks, porcelain and void of expression. Others, like my own young captor, strode down Mamoiada's confetti-strewn lanes with faces bare to the world. Here and there a glint of mischief escaped through a pair of brown eyes. All of them set to work plucking onlookers from the roadside, expertly maneuvering their lassos over shoulders and reeling in catches. The best seats in the house were perhaps occupied by those spectators perched in balconies above the parade route, clutching glasses of wine and hovering just out of harm's way. It was wine and merriment for all as the sky began to darken. Those of us on ground level made our way to the town's tiny main piazza, where a man with frazzled white hair, dressed in a somber black suit, handed out cookies and plastic cups filled with local red wine. Traditional dance music streamed through the second-story window of an apartment. The piazza transformed into an outdoor dance hall, the crowd forming a circle and linking arms. It was easy to pick out the locals. They followed the elaborate footwork of the su passu torràu, su sàrtiu, and su dillu with ease. They were synchronized. And they never tired. With each hour's passing, the wine flowed, a thick coating of stars spread across the sky, and the shuffling and tapping and twirling went on. Sardinia's mountain air and wine coursing through me, I grabbed a stranger's hand and took to the dance floor. Stephanie is an English teacher and writer currently based in Mantua, Italy. You can read all about her Italian adventures at . She travels for the fresh air and the stories.